This is it folks, the end of SATA is upon us and the WD Blue SN500 is harbinger to the whole affair. Stuffed onto its 80 x 22mm frame is a single 500GB chip of WD’s TLC 3D NAND alongside the company’s own homebrew controller tech. And that makes for a mean combo, delivering blistering, SATA-destroying pace for only $78 (£67). WD has re-energised its push into the SSD market in recent months. Starting with the high-performance WD Black SN750, the company has been shifting some product away from OEMs and redeveloping it for the client market. 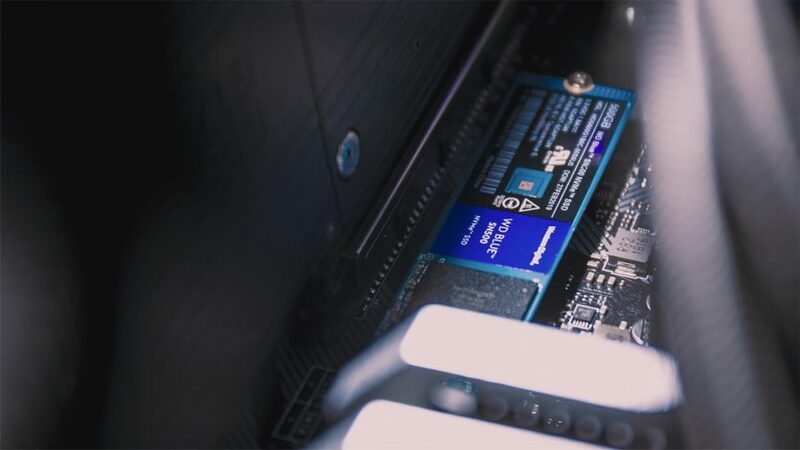 While it remains dependent on the same Sandisk NAND flash, a little tweaking under the hood helped turn its top drive into a tempting alternative to Samsung’s 970 EVO Plus NVMe: the domineering de facto SSD for high-performance rigs. But WD Blue drives have always been about budget-friendly performance, even back in the days of spinning platter drives. The WD Blue SN500 is cut from the same cloth. It’s fitted with the same sturdy TLC 3D NAND as ever, but, as an added cost-saving measure, lowers the controller spec to PCIe 3.0 x2. That connection theoretically maxes out just under 2,000MB/s. Few modern NVMe drives we’ve tested have been limited to the PCIe 3.0 x2 bandwidth, most dating back a good few years to the first batch of NVMe PCIe M.2 drives. The HyperX Predator M.2 drive matched the 2,000MB/s bandwidth utilising PCIe 2.0 x4, but that was also some $400 when it first launched. How far we’ve come, huh? The WD Blue SN500 is rated up to 1,700MB/s, nearly half of the 3,500MB/s the Samsung 970 Evo Plus is capable of. The SN500’s write speed is similarly nothing to write home either, coming in at 1,450MB/s. But that’s not a fight this drive ever stood a chance of winning, nor hoped to. Instead, it’s a damn-sight faster than even the very best, fastest SATA SSD drives, easily pushing three times the performance of Samsung’s 860 Evo at 550MB/s read and 520MB/s write. This 500GB drive is capable of 300 terabytes written during its lifetime, which is covered by a limited warranty for five years. Identical to the Samsung 860 Evo and 970 Evo Plus in this regard, WD is pretty confident its NAND flash is up to an industry-leading standard. 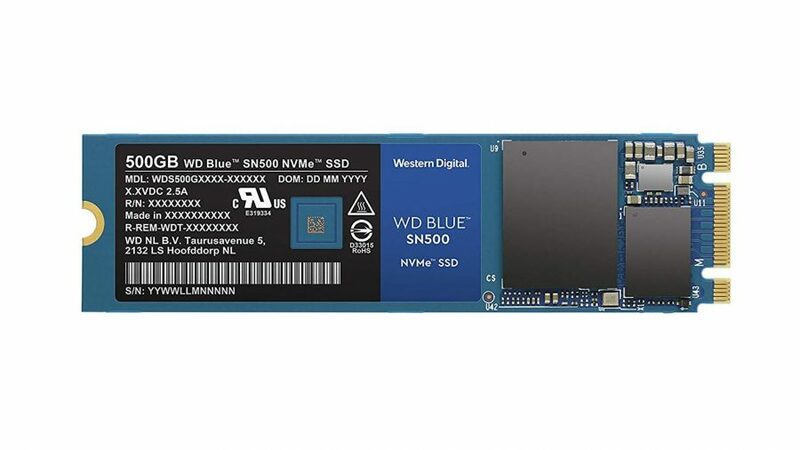 The WD Blue SN500 gets remarkably close to the 2018 WD Black PCIe drive in sequential write testing, although is hampered by that PCIe 3.0 x2 connection during sequential read. It does retain admirable pace in random 4k testing, however, making for a rather snappy primary boot drive. In our benchmarking the WD drive actually outperformed its rated speeds by just a little in ATTO, whereas Samsung’s 970 Evo Plus ever-so-slightly under-performed in benchmarking. The difference is entirely negligible, but WD’s certainly playing it a little safe with its marketing materials. But synthetic chops often fail to translate particularly well into the real life, and the WD SN500 makes up for some of that lost ground in representative real-world benchmarking. It’s surprisingly well on-pace with the best drives during our 5GB compression test, and loses few precious seconds during a 30GB file transfer. And we can safely say it destroys every SATA drive we’ve ever sent through our benchmarking gauntlet. Sure, that’s an easy feat for NVMe, the far superior protocol, but the WD drive is complimented with a competitive price tag to match. The Samsung 860 Evo 2.5-inch 500GB SATA drive will set you back $78 (£74) of your hard-earned cash, while the WD SN500 is just $78 (£67). Granted, that’s not a great deal of cash to be redistribute elsewhere in your gaming PC build, but the WD is not only cheaper, it’s three times faster. If you can stretch your budget a little further, Samsung’s 970 Evo Plus requires only a little more investment. And WD isn’t without competition from the gradual influx of QLC drives into the market, including Intel’s 600p QLC. But the WD Blue SN500 should be able to hold off the competition for a few quarters at least. While there’s still something to be said for SATA as a handy hot-swappable media, and the most flexible storage option if you’re limited to only one or two M.2 slots, its days of boot drive priority are well and truly over. It’s impossible to recommend a SATA drive over the WD Blue SN500 now that the price premium of NVMe has been well and truly squashed. A great value, budget SSD that puts an end to SATA boot drives once and for all.